After a competitive game with a last play loss to BC & a fantastic first half that fell apart in the second in Hamilton, the Argos start digging themselves out of this hole back into the playoff race in the Labour Day rematch. Will Dan LaFevour right the ship? 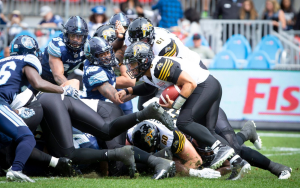 Argos & ticats. East Semi. It’s on. The 4th matchup of the year between the Argos & ticats happens at the Donut Box. The Argos & ticats face off for the second time in 5 days. Have the Argos made the corrections to come out on top? Will the ticats sweep the season series? All this & more in a little over 5 minutes.